As I was walking and driving around our neighborhood this week, I was struck by the stunning display of the magnolias. Once again, I snapped these quickly with my iPod. No time to run home and grab my camera. This magnolia, with larger, burgundy-colored blooms, is the only one of its kind around here. 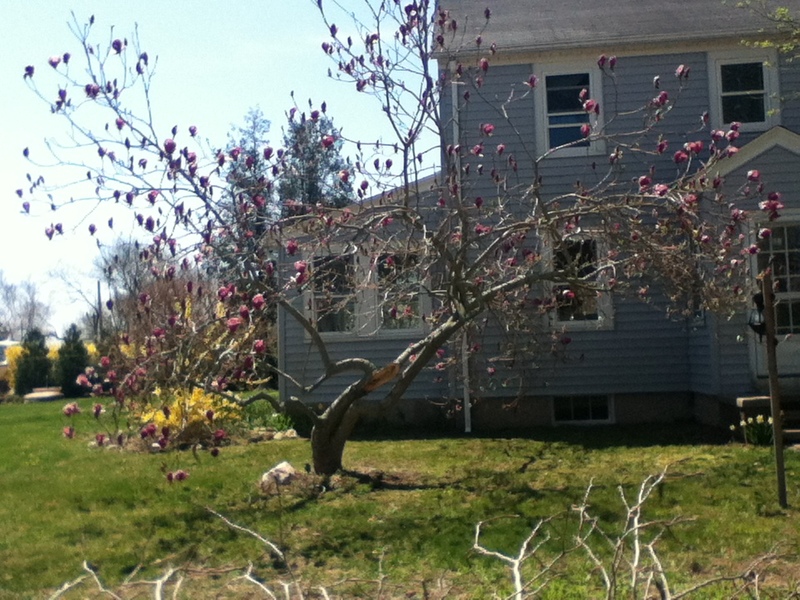 It lost a major limb during superstorm Sandy, but it seems to be hanging in there. You can see where the branch tore off. I hope it survives. The flowers are single. Probably an old cultivar. This pink one is common, but that doesn’t mean it’s not amazing. Look at how full it is. It almost hides the house, doesn’t it? And finally, the white, fragrant beauty at the end of the street. It’s the first to bloom and it’s kind of winding down now, but you can still smell it when you walk by. The dogwoods will be next, and I’m ready! I just bought a Magnolia stellata today; you must have read my mind! Love this shrub and have wanted one for eons. It has fat catkins in the spring followed by a huge display of magnolia “stars”. Now I’ll try to be patient until next spring and keep my fingers crossed! How high does it grow? I love Magnolias! Our neighbours have one in their yard and it’s in bloom. Stunning! I am particularly fond of the white one because it has such a wonderful scent. I always love seeing the spring blooms. Can you believe there’s not a magnolia tree in my yard, a’livin down here in GA as I do? Can’t believe one wasn’t planted back in the early 70’s when the house was built. I thought you’d be drowning in them. 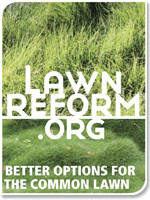 Maybe you should think about planting one, CJ. 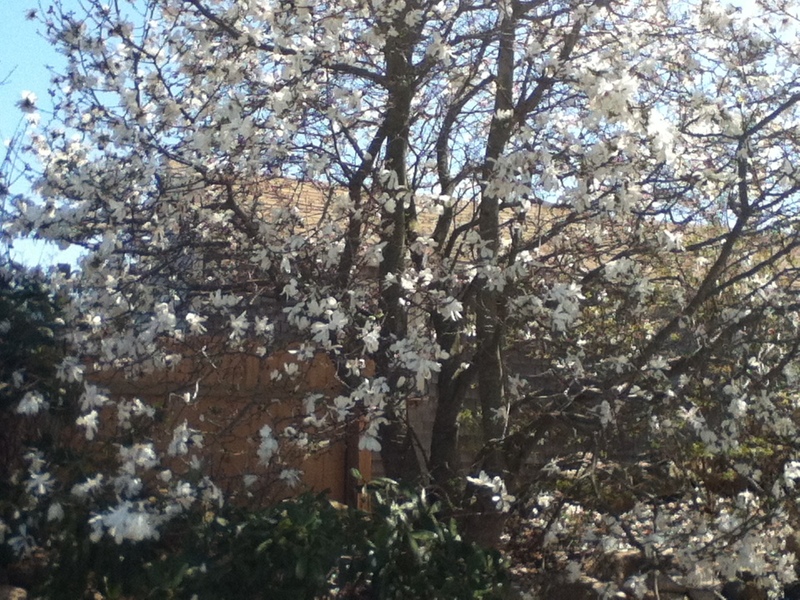 I just stare at my neighbors’ magnolias, which are beautiful. You’re right, though. I should plant two at least. Magnolia stellata can be purchased in all white (my choice) or all pink varieties. Centennial is absolutely spectacular! Cultural info says it will grow 15-20 feet tall and 10-15 feet wide, but I’ve never seen any taller than 15′ here. It’s very dense and compact and makes a wonderful specimen tree. 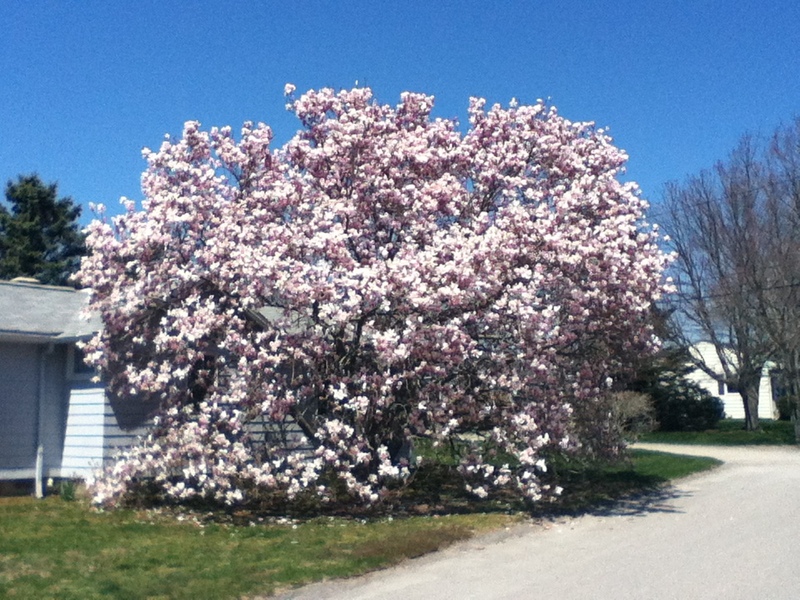 A plus is that the flowers last much longer than the saucer magnolia that is so popular in the south and here in Rhode Island in Westerly. It sounds lovely. Are the flowers fragrant? Yes, fragrant and showy! 🙂 I think your last photo may be “Centennial”.